Since the time smartphones burst onto the market, developers have come up with an innumerable range of apps designed to make lives easier. Travel apps are no less ingenious, but with the number of such applications on the rise, being simply useful is no longer enough; it also needs to be quirky and innovative (think packing for a pet). As global smartphone adoption continues to increase, travellers’ demand for mobile apps shows no signs of stopping. According to a report by mobile marketing specialist Somo, 30 million individuals seek travel information via mobile devices and travel apps each month, while 44 percent of travellers even plan their trip via mobile device. For the social and mobile consumer, apps that provide access to reviews, purchase comparison and local recommendations have become an integral part of the entire travel process. So, while travellers can still glean all advice and itineraries from experienced travellers and popular blogs, the latest in apps offer a way to digitally tap into the expertise of a guide with the advantages of GPS to make the journey smoother and the smartphone smarter. #1. Guides by Lonely Planet – The city guide app helps users plan trips and learn about worldwide destinations. Launched in 2016 with content covering 38 cities, including London, New York, Paris and Rome, the Guides app includes an average of 1,000 points of interest for each city, and allows users to download individual city guides and access offline maps for these locations. Users can browse points of interest based on categories including ‘see,’ ‘eat’ and ‘sleep,’ among others, and can also browse lists of curated content based on themes. 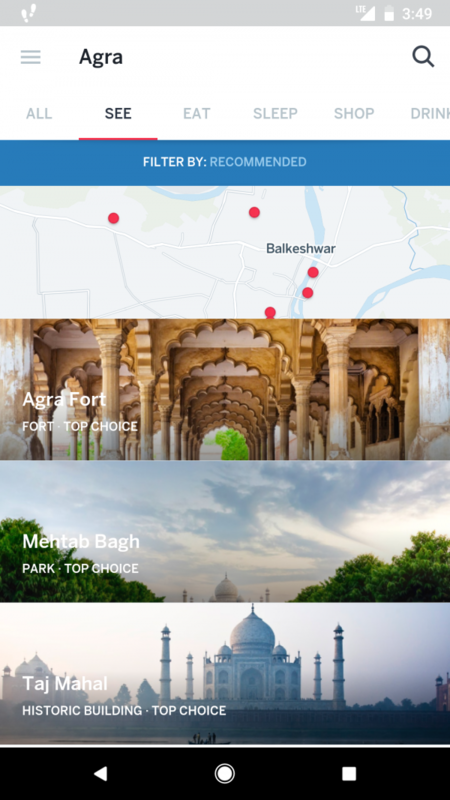 Users can also browse a city’s map to find attractions in a particular neighbourhood, and can also browse attractions based on their current location. In addition, the app provides an overview of each city, as well as tips for planning a trip on various budgets. Guides has expanded massively since it launched and is now available for 177 cities, and remains free. Read more about Lonely Planet India’s journey in the country, here. #2. AudioCompass – Whether you’re looking to try a new adventure sport or simply soak in a city’s culture, this official audio tour app of Incredible India, AudioCompass, is a handy guide for anyone who’s been disappointed by tourist guides. It has well-researched audio guides narrated by local experts, that bring alive the history, culture and heritage of destinations. From the architecture of the Taj Mahal to even homes of Bollywood stars in Mumbai – the app covers everything. With more than 1200 attractions in different countries including, India, Singapore, Oman, London, and Istanbul, there’s something for everyone. The destinations can be downloaded on phone for offline use as well. While some of the audio on the app is for free, users can upgrade to Pro for just INR 49. Available on iOS. #3. PackPoint – PackPoint not only helps travellers organize what they need to pack based on duration of travel, it also tells you the weather at the destination and any activities planned during the trip. 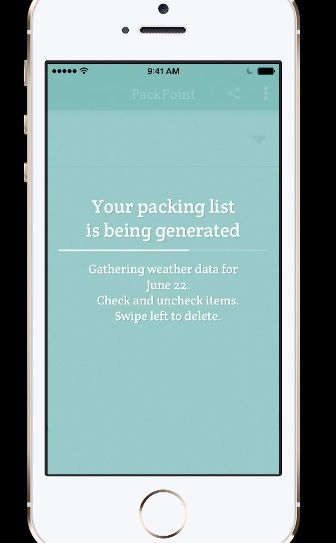 The app prepares a customized packing list, based on the data it accumulates from the destination. One of the other highlights of this app is its feature that lets travellers create a website for their packing list. By doing so, it allows users to share the website link with fellow travellers in a group so they know what to pack as well. #4. GateGuru from TripAdvisor – In addition to offering basic flight tracking, GateGuru connects the dots between many other intricacies of travel plans. The application basically allows users to view their TripIt and KAYAK itineraries, details such as where to check in at the airport, estimated security wait times, and maps of amenities within the terminals, replete with 35,000 reviews and tips and 10,000 photos from fellow travellers on the airport terminal and all its amenities. The app probably offers one of the most comprehensive listing of airport amenities. The search engine is easy to navigate and also lets users bookmark favourite airports and preferred amenities. GateGuru currently covers 29 Asian airports, apart from other international airports, and is free on iOS and Android. #5. Trips by Google – Google Trips serves as a trip planner and travel guide for anyone who is exploring a new place. The free app, which is available on Android and iOS, organizes plane tickets and hotel reservations, offers editorial guides to more than 200 cities, and makes personalized recommendations based on a user’s Google history. While Trips lacks pro-travel features like the ones on TripIt, it makes up for that lack with its useful city guides that leverage a range of Google services. 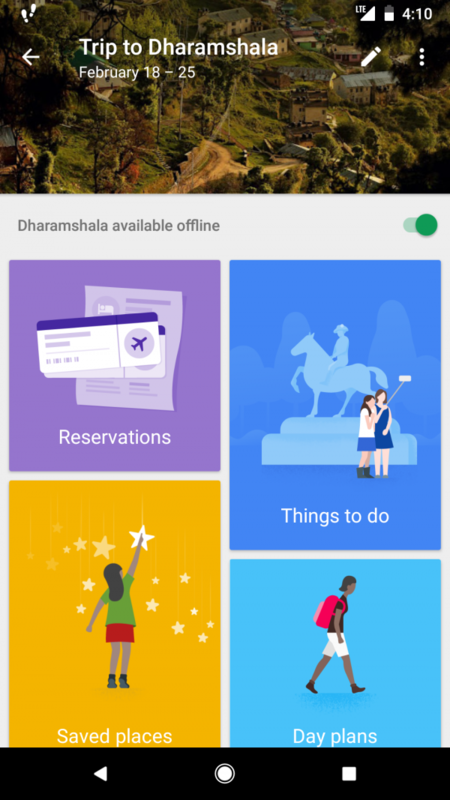 The heart of the app is in its ‘Things to Do’, which builds custom itineraries based on how long a traveller will be in town, popular destinations, and anything that they may have previously starred or saved on a Google service. Moreover, each guide can be edited to include other destinations. Best of all – all of this works offline as well. Read more on Google’s efforts at reshaping the travel industry, here. #6. Weather Pro – While nobody can control the weather, this app definitely helps them prepare for a rainy day. Weather Pro offers weather reports for more than two million geographical locations, feeding in everything from cloud formations and atmospheric pressure to wind speed and humidity, all in extensive detail. The core functions of this app should help users sail smoothly and are easily accessible via five main tabs. The most amazing features of Weather Pro include a 3-hourly forecast for one week ahead, a list of chosen favourite locations, alerts for extreme weather conditions and a global satellite to give general weather update in major cities. A big plus- It is crazily accurate. The app is available on iPhone, iPad for INR 159 and for INR 220 on Android.